As most of you know, my blog mainly consists of Film Reviews but recently I’ve been throwing in something a little different. Some will be familiar with my “Let’s Have A Sit Down” running feature. If not, the episodes can be found here… #1, #2 & #3. This is another change of direction for me but will most certainly not become a feature. You’ll understand why, in a moment. This is still a movie related post but is the result of another hobby of mine… painting. Some of you may find this a bit morbid but this painting was done using the remains of my late father. He died two years ago and after getting him cremated, I decided at that point that I would commit them to a painting that he would have liked. It’s took me all this time to work up the courage to do this and for that reason, plain and simply, this will not be a regular feature. And the result… ? 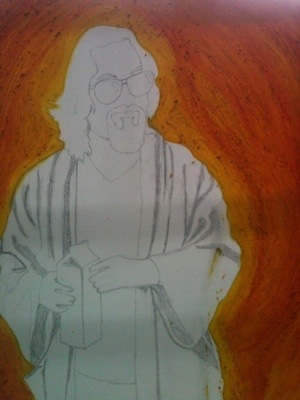 The result was The Dude from both of our favourite film “The Big Lebowski“. I shared lots of great movie experiences with my dad but probably none more so than the cult Coens classic. 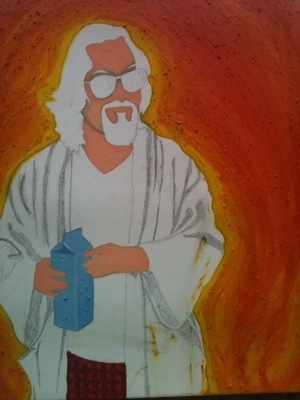 The reason this film resonated with us is because my dad actually looked and acted quite a lot like The Dude himself. So here is the 5 stages of the Oil painting that I done for (and including) my late dad Gerry Walker. This entry was posted on July 11, 2012 at 6:37 pm and is filed under Uncategorized with tags 2012. You can follow any responses to this entry through the RSS 2.0 feed. You can leave a response, or trackback from your own site. That is absolutely amazing, Mark. Very well done! I don’t think it’s morbid at all, I think it would do your father proud. Cheers Andy. I also think my dad would have loved it. I had to choose a happy fitting image to lighten the mood and The Dude seemed the perfect choice. Tom Waits was another option but not the cheeriest. This really is amazing man. Thanks so much for sharing this. Your welcome man. I’m glad people appreciate. Thanks for stopping by. Cheers Ryan. It’s bizarre though, every time I look at the painting, I see my dad smiling back. That can’t be a bad thing at all. This would totally make your father proud. It is excellent. I would buy that if I saw it at the store. You have many talents Mark, exceptional post. As I said on Twitter I don’t think it’s morbid. It’s beautiful. My father died 11 years ago but it appears to me as if you’ve come further in your acceptance process. Unlike you I haven’t touched the remains of my father. I don’t even know where they’re buried since it’s in an anoymous memorial place without any stone, following the wishes of my father. I think the idea was to make it easier for us. My father knew a lot of stuff, but sadly I think he was wrong about this. Thanks Jessica. Yeah, it’s a tough deal losing a parent. My father died very suddenly and he was only 53. This painting wasn’t part of his wishes but I know he would definitely approve. I found it really difficult to paint though, it was almost like reliving the moment, yet also my chance to finally let him go. I shared some great film experiences with him and I always used to go the cinema with him since I was very young. This image is the one that sums my dad up most though. 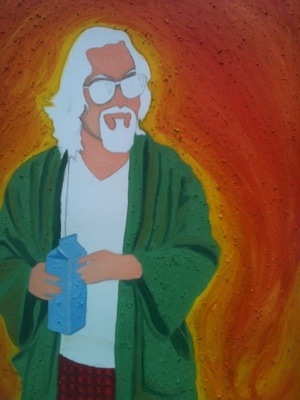 He lived life like the Dude and also looked very much like him. I’m sorry to hear you didn’t get the chance to fully come to terms with your grieving. You’re dad obviously seen it a certain way but I don’t think I would have liked that either. I took complete control over my dad’s remains. Sorry to hear about your dad, man. That is a really cool thing to do Mark. Aside from throwing them over Jeff Bridges on top of a cliff, I’m sure your dad would agree this is the next best thing. There is no cooler film character to be immortalised in. Haha. Yeah, I totally agree man. The Dude is the coolest of all characters. ‘he likes to take it easy for all us sinners’. Thanks for sharing this very personal memorabilia from your late father. My mom was cremated too, but she died when I was 16. What a great way to commemorate your loved one! You were 16 when your mum died? Man, that’s a tough one. And I thought I lost a parent too young. Don’t know how I would have coped that. Thanks Ruth. 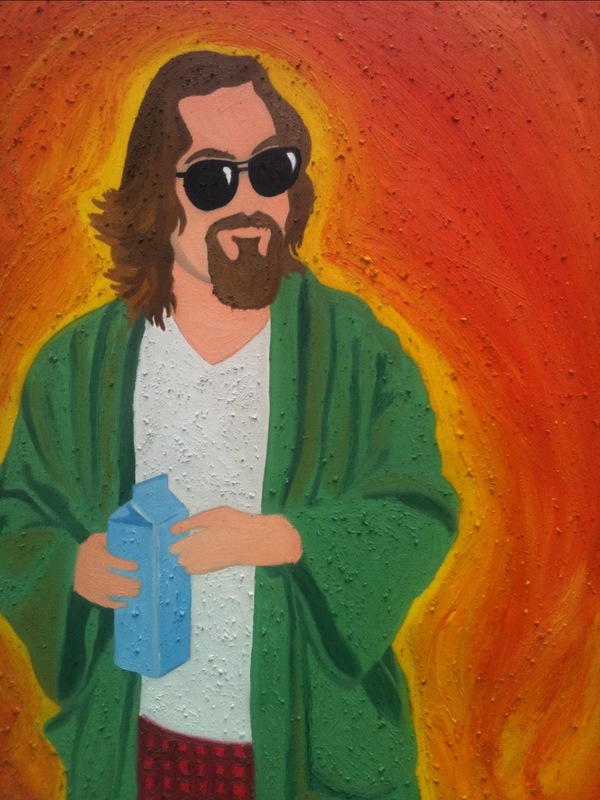 “Gerry, The Dude.” That has a nice ring to it. I totally agree though. Things do happen for a reason and without my dad passing other beautiful things in my life may never have happened. I can’t imagine it on my birthday though. That must make your birthday a bit bittersweet does it not? I am very jealous of your skills young man! Really cool!! Woo Hoo! Shamone my man. Proper Bo? I love it. Cheers Scott. I love it Mark, It’s really great and the Dude is one of the best characters ever. Cheers man. If I remember rightly, you done a great drawing of a certain Mr. Bridges yourself a while back? Twice? I think I only seen one of them. Do have links for them? Great work man, what an ingenious way to pay tribute to your dad. Fantastic choice of character too (I agree it’s a better choice than Tom Waits). Mark, this is awesome. What a really cool tribute. Cheers Eric. I’m quite happy with it myself. Glad you like it man. Mark, i really like this painting. My brother died not long over a year ago now and I wish i could pay such a tribute too. Fantastically unique and fitting way to pay respect to your dad, excellent work sir! Thank you sir! Sorry to hear about your brother man. That’s a sore one. I agree tho, it’s a fitting tribute but it’s damn hard to get through. Splendid painting, Mark! I don’t think it’s morbid; it’s actually very sweet. It is so nice that you shared a favorite movie too. Thanks Fernando. Yeah, I was very lucky to share a lot of common interests with my dad. He was a friend as much as a father. Sorry I haven’t commented for a while. WordPress, for some reason, switched off the immediate updates and made them weekly instead.So I have yet to even look at your 3rd “Let’s Have a Sitdown”, I believe. No problem man. My comments have been sparse also. I’m finding the old blog getting rather busy these days. It’s getting hard to keep up. I was very fortunate to share a common interest with my dad. If truth be told, he influenced me greatly so it was inevitable that we would agree on lots of things. 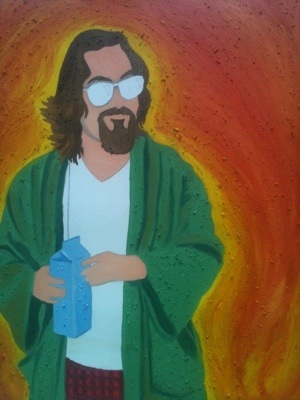 The Big Lebowski was certainly one of them.